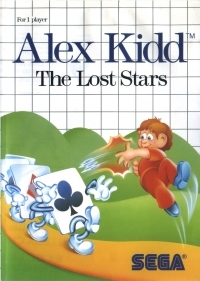 Box Text: Alex Kidd: The Lost Stars has similar gameplay like in the other Alex Kidd games, but this one's a little too easy and it is designed for kids. Once again you play Alex, whose mission is to run through each location, knocking down enemies, and obtain the six miracle balls. These balls are hidden inside the strangest places like golden eggs, the Fantazy Zone ship out of action, clamshells, Christmas presents, pumpkins, and desk bells. This is a list of VGCollect users who have Alex Kidd: The Lost Stars in their Collection. This is a list of VGCollect users who have Alex Kidd: The Lost Stars in their Sell List. 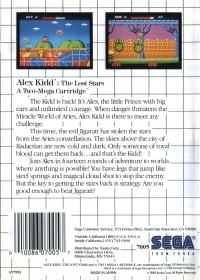 This is a list of VGCollect users who have Alex Kidd: The Lost Stars in their Wish List.